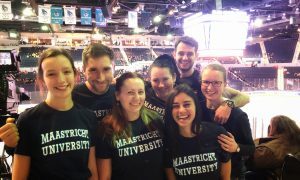 Six FASoS students from the BA European Studies Programme: Sabrina Luh, Romane Dideberg, Anna Marino, Jeanine de Bruin, Dominik Schmidt and Thierry Bleijswijk, together with the coordinator Dr. Dorina Baltag, are representing Maastricht University at the transatlantic EuroSim 2019 simulation. EuroSim is an annual international inter-university simulation of the European Union that offers a unique opportunity for selected students to exercise their negotiation skills in a multicultural environment and test their diplomatic skills in practice. EuroSim 2019 is organised by the Transatlantic Consortium for European Union Studies and Simulations (TACEUSS) and takes place at St. John Fischer College in Rochester, NY (USA) between 28-31 March 2019, where students negotiate on the EU Multiannual Financial Framework. Let’s wish them good luck!